As previously reported NTDC Ltd has the role of developing the Regional Economic Development Plan (The Plan) for the North and North East as part of the City Deal Agreement to make sure we leverage the opportunities for the whole region. As part of the consultation phase we aim to engage with as many businesses (one-on-one) in the region as possible – especially those invested in our high growth sectors such as: Food, Forestry, Manufacturing, Other Value-Adding Agriculture, Tourism, and new Digital Entrepreneurs. The intention is to learn how we can support businesses to expand and remove identified barriers. If you would like the opportunity to meet with NTDC, please contact Maree Tetlow CEO e: maree@northerntasmania.org.au or 0408 825 060. NTDC is currently seeking to appoint two new Board Directors with specific expertise and networking capability in either small business and/or digital transformation sectors. Board positions are for a two (2) year appointment and will attract a nominal sitting fee. Applications can be submitted by addressing the Selection Criteria in the Position Description available by emailing admin@northerntasmania.org.au or contacting Chair, John Pitt for a confidential conversation on – 0417 310 490. On the staff front, unfortunately due to illness, Ellie Pardoe has stepped down from the project role at NTDC. As of late February early March we now have two part-time experts, Georgina Brown and Sally Murfet. Sally will be primarily managing stakeholder engagement and communication aspects of the REDP whilst Georgie will take on the role of progressing and monitoring the key outputs of the project. 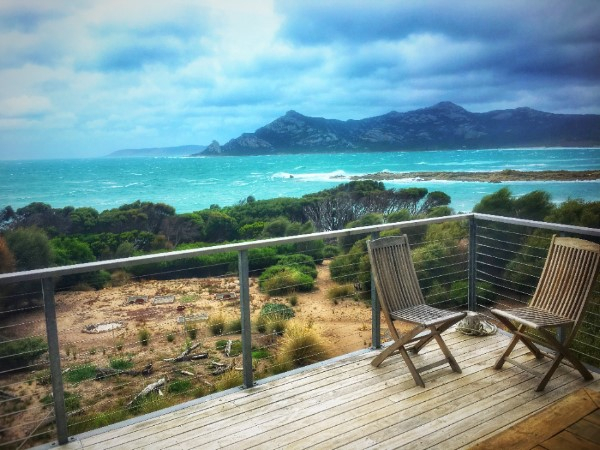 During February NTDC’s CEO, Maree Tetlow and Chair, John Pitt flew to Flinders Island (FI) for the day and made a few pit stops whilst there, including a visit to the FI Council and Flinders Island Tourism Business Association, FITBA. This was an opportunity to update our FI stakeholders on NTDC’s work over the past few months and how we can support Council and the business community achieve further progress for FI. It was excellent news to hear that tourism had a good year in 2017 and the Telstra Upgrade project is now underway. One of their last stops for the visit was to the amazing Nautilus Accommodation at Killiecrankie where the photo below was captured. Such a stunning view. The Centre for Defence Industry Capability (CDIC) is delivering a nation wide series of seminars for businesses that are seeking to learn about opportunities in the defence market. Click here to register your interest or here to find out more. The Australia China Business Council and Alibaba Group are delighted to invite you to a special workshop series in Tasmania exploring e-commerce, tourism, food and product opportunities through the Alibaba Group e-commerce ecosystem. To register and find out more click here. Free community event featuring international food and wine, entertainment, kids activities and MORE. The Tasmanian Women in Resources Awards provide a unique opportunity to recognise the excellent and hardworking women and companies in this sector and serve to promote, and encourage more women to consider the attractive career opportunities available in the mining and resources sector. The 2018 Tasmanian Women in Resources Awards are now open in the following categories in multiple categories. The selection criteria are downloadable from here, the TMEC website and nominations are being accepted via Awards Force, an online platform.